It had been a success on several parameters. One, the door had opened despite the sturdy rich-man lock. Two, all doors locked and yet a torch was burning inside and the furnace was in process. Something was off and it was a good thing to be among those that would learn of it first. Three, no one - not even Doyle - had abstained from entering the Glassworks with Igna, which meant that if it was a crime to be punished for, there was a whole bunch of ‘heroes’ that needed punishment, among them including seemingly friends of the guard. As soon as Igna had scanned the hallway, he followed Doyle in his tracks and listened to the door opposite of where Doyle was entering. As soon as the knight had the door open, Igna had a mind to slip in behind him and see what happened. Instead of just entering, Doyle started talking. It occurred to Igna that while it was probably true that he would annoy the old Tian more than Doyle, he at least would find him soon enough to be able to speak with him... He rolled his eyes and used the waiting time to try the door on the opposite side of the hallway. If they managed to find another door locked, he was pretty certain that he could be of service again. Usually - you shouldn’t be talking about ‘usually unlocking doors’ to these guys - the doors inside, if ever locked, had lesser quality locks. Unless of course it was safeguarding particular valuable goods. Igna had only heard of such places. All in all, he was still too young to be part of the actual criminal events. His job was pushing information to Jubrayl and represent. Igna will move behind Doyle and follow him inside. While he wait for Doyle, he will open the door on the opposite side of Doyle. Doyle and Choni's attempts to calm Venka helped a little, but she was deep enough in tumbled thoughts and emotions that by the time the group had entered the Glassworks, her agitation was back. In the back of her mind, she acknowledged the possible consequences for their actions, but she meant it when she said she would take the fall, and couldn't be bothered to give a damn at the moment. She paused, indecisive about where to start looking and was passed by Doyle and Rapid as they started checking different doors. Dammit Ameiko, where are you? she thought bitterly. The noise and heat from the furnaces were pounding at her senses, and she felt the need to yell or hit something, to do anything to alleviate the building anxiety she was feeling. When she felt someone grasp her arm, she whirled around, acting on impulse and likely to tear someone's head off. Her retort caught in her throat, however, when her eyes met those of the Shoanti woman. It felt as if someone had doused her with a bucket of cold water while her mind tried to process the woman's action. 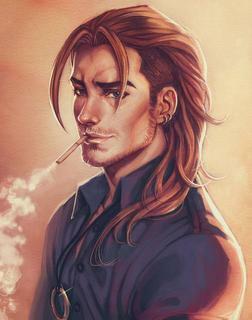 She recalled when the emberkin had taken her hand at the festival, and while Choni was either progressive enough or restrained enough to refrain from taking the man's dignity, if not more, she also clearly held onto the traditional Shoanti values regarding personal space and social interaction. Venka would be forgiven then for almost missing the words that came out of Choni's mouth. "Eye of the storm." While the words were different, the meaning was similar to something her mentor had drilled into her over and over. She closed her eyes and took in a deep breath, slowly letting it out and willing herself to find relax. Thankfully her mental distress had been taken care of by Choni's unexpected contact, but her body was still far too tense. She rolled her neck and shoulders and loosened her grip on her weapon, then opened her eyes and gave Choni a gentle smile. "Thank you," was all she said. It was enough for now. She really was grateful, could see the two of them becoming good friends, and made a note to spend some time with her when things had settled down. Last edited by LittleBlueNA; 01-04-2019 at 03:13 PM. Despite the fact that searching the Glassworks as they were doing was clearly illegal, Edledhron was completely calm. He had never had much qualms with breaking rules or traversing the gray areas of ethics. So when he spotted a child looking out of the open window, the elf did naught but raise a single finger to his lips as the others pressed on. The group moved slowly at first, as if they were still deciding their true course of action. The knight spoke in a hushed voice about not infuriating the 'old man', and Edledhron nodded slightly. In truth, he didn't care about Lonjiku's feelings, but it would do no good to accidentally kill him in the heat of action. Beyond that, the only words spoken came from the Shoanti as she... comforted the other woman. He thought he was right, but the entire interaction was confusing to him at best. The elf, however, did his best to tune out the others for the most part. They would undoubtedly be needed, but other than Igna, they seemed unused to things of this nature. But even trying to ignore them, he couldn't let Venka's declaration pass without some acknowledgement and the elf spoke softly, "Don't move so quickly that you miss something. Take Doyle with you..." Edledhron paused as his viridian eyes flickered to Choni, "Stay with me and be quiet." To be honest, he had almost told her to stay by the entrance, but he had no idea if the boy he had spotted earlier would tell someone about what he had seen, so he felt that whatever they did here had to be done quickly. As Doyle and Igna did whatever they needed to at the doors, Edledhron Stealth: 19 (from earlier post)quietly glided a bit further down the hallway as he tried to Perception: 28 (Nat. 20, also from earlier post. )sense something, anything that would give a clue as to what needed to be done and Also, Detect Magic is still active.what they might find. Alright. Tentatively splitting up, but he's not going too far. Sort of stalling to see what the Nat. 20 brings to the table. I also did my best to not contradict anybody's post (except Kapera, who just mentioned that she's a follower). The group has an unspoken way of how they handle the situation, and the rules are fairly simple. Doyle decides where to go, and everyone runs around him, checking for traps, locked doors, and senses of what's going on. Where Doyle makes no attempt to hide any of his noises, everyone else is fairly quiet. And so they head on, into the deep rumbling depths of the Glassworks. Forgoing the first set of doors into the rumbling room, Doyle I hope to God this is right, I wasn't certain if you did the double doors at the top or the ones on this mapheads onward prepares to open the door and head onward. Igna has other plans. As rapid as his name might suggest, he checks both doors for locks. Neither are locked; nor are they trapped. The door behind Doyle, the customer entrance, is a round room, showcasing different types of glass. Opaque, stained, styled in certain ways; the different shapes, the different images, both Avistan and Tian in nature, all illuminated by a bright ceiling glass window that brings light down from above. There's no sign of life here, and no one has dusted the glass in a few days, by the look of things. There are doors to the wall, but Rapid doesn't have the chance to do so. Doyle heads long into the rumbling room, the source of the heat and the center of the Glasswork's, well, work. And he is quickly show the horrors of what has happened here. The room, long and laboratory-like, is a furnace, literally. The walls closest to him block the the entrance to the actual burning furnace, the hatches of which are open. The light comes through, but even then, the glass windows, which are hard to see through, provide a reasonable amount of light. Tables line the center of the room, along with tools, but across them trash and worse are strewn about. Nearer the center, there is blood, gore everywhere, and the bodies of dead Tian men and women, their throats slit, the stomaches opened, their bodies defaced and mutilated. He can't tell initially how many, but something else, less gored, is visible nearby. The figure of a man, encased in blue glass, improperly made. The stands long, his eyes rolled back into his head, his skin scalded permanently. His hat sits off his head, disrupted by the pouring of glass on him in life. His arms are raised in protest, and his robes are stained with something, blood or worse. Even then, it's easy enough to discern his identity, they saw him the night before. Lonjiku Kaijitsu is dead, encased in glass: and by the screaming grimace on his face, alive. The roaring of the furnace blocks the announcement of Doyle's entrance, but he sees plainly enough the culprits. The Goblins, eight in total, are scattered about the room, playing with the tools or the dead. The tools they pick at their overly long teeth with, using glass like a mirror. Some have the intestines of Goblins and play with them, one using it as a jump rope, two others slapping one another (and themselves) with competing strands of the same stomach. Another gnaws mindlessly on the face of a Tian man, not taking the skin off but testing its elasticity in death; the man, rigid, is losing any semblance of life. Goblins have invaded the Glassworks and taken it as their own. The nearest Goblin notices the movement in the dark, a lucky break, but doesn't act. He tilts his overly large head, and spits out a broken tooth, something he was moving around in his mouth. "You new. You with Big Ear?" You have a Surprise round to move in and do all sortsa stuff, if you wish. You have Initiative as well. The Goblins, except G2, are all unawares of you lot. Hopefully everyone kept their lunch down. Goblins are fun to write, but also terrifying. The furnace can be used as a weapon, in case anyone is asking. I wanted to find music for this, but I can't find anything right now, and it irks me. I made add it later or in the next post. Venka ended up following Doyle into the furnace room and her eyes went wide. She had seen some things in her travels, but this... this was beyond words. It would be a lie to say her stomach didn't roil at the sight, but she managed to keep it under control by focusing on the more important things. When Doyle roared, she sprung into action, hot on his heels. Understandably for a heavily-armored knight, but to her immediate frustration, he threw himself right into the midst of the goblins. As she moved she noted the bodies. She couldn't find it in herself to care about Lonjiku's fate, and didn't see the telltale streak of white on any of the women, so far. Had Choni not stepped in just a few seconds prior, who knows how she would have reacted, but right now her mind was clear. It's okay, Ameiko is strong, she'll be okay, she told herself. The best thing she could do right now was to take care of these little buggers as quickly as possible. She caught up with the slower-moving man just as he thrust his shield at one of the goblins and began demanding answers. Acting like they were with Tsuto looked to be out of the question now. For good measure, she dropped her torch and thrust her polearm into the shoulder of one of the nearby goblins. The weapon was fast and agile in her hands, the investment in the darkwood shaft starting to pay off. "Tell us where she is unless you want more," she said. She was going to kill it either way, but it didn't need to know that. "We need to have a little chat about tactics when this is over," she said to Doyle in a lower voice. The reach of her weapon, along with the speed with which she could wield it, were being largely negated due to their current positioning. Standard Action: Attack vs G? (the one whose tag is obscured by the wall/furnace), 15 to hit for 4 damage. Last edited by LittleBlueNA; 01-17-2019 at 04:52 AM. Looking into the exhibition of glassworks, Igna sighed. He knew that these things were precious as much as coin and gems, but he never really learned to appreciate it. He thought the process of making glass sculptures was too much a hassle, when you could do so much with a knife and a piece of quality wood, like say... cherry. 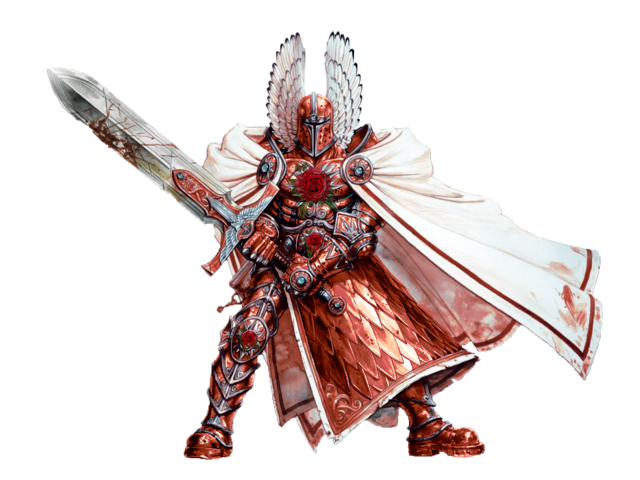 He glanced one last time at the doors, noting that they were there, if they needed it, but then Doyle managed to break the door and Igna surged from his position in behind the armored knight. Ugh. Shouldn’t have done that... The heat, the smell of burned skin and opened guts, the sounds of gleeful munching and the gory sight of destruction hit him like a hammer. As Doyle started moving towards the goblins, Igna stumbled towards the construct of glass, holding the screaming Lonjiku in a relentless grasp, through death. The turmoil in Igna’s stomach was turning into a maelstrom of nausea and as came around the backside of the glass, nearly falling prone over a wrecked bench, the horrifying sight of the dead men and women overwhelmed him completely. Igna caught himself against the corner of the wall and burped. Then came a spew of his breakfast - spraying over the corner of the wall. ugh... waah. Again. He eyed the goblin and had the gaze returned. Doyle shouted his anger at them behind it and Igna nodded towards the knight with his head, You should be looking that way, gobo. I have to puke and that one will be killing you if you don’t do something. Last edited by Dressedtojazz; 01-16-2019 at 05:03 AM. 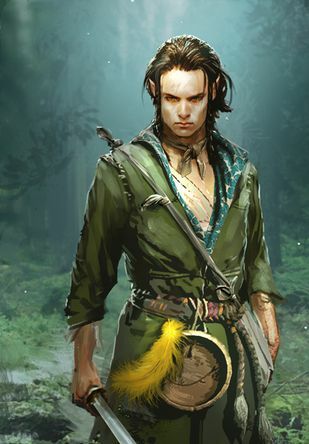 Before he can react, the elf heard what likely signaled movement from his companions, as Venka called for information and Igna displayed why the young were difficult to rely on in combat. At least, he thought the vomiting sound came from the young man. For his own part, the elf sighed as he prepared his mind for combat and moved into the room, Move during the surprise round. 3 north, 2 northeast.moving the direction that the knight and the warrior woman had even as he drew his blade. But now he could see what had effected his companions so much, though for his own part he wasn't concerned with the dead. To him, the dead were lucky. Edledhron paused for a moment as he took stock of where the others were moving, then 1 Northeast then 1 northwesttook a step then Acrobatics check of 12, should succeed assuming that the tables are about 30 inches tall as they are in reality.jumped onto one of the small tables, though not the bloody one. And from his elevated point, he then Attack Goblin G3, Att 18 / Dam 7 - Assuming a standard goblin, it should go down but I tried to make it ambiguous.coldly stabbed into one of the foul and pathetic creatures. As he waited for it to fall as he expected, he called out in a loud voice, "Surrender now, Goblins, or you will all die." His voice was cold and calm, as if he didn't care whether the enemy lived or died. Instead, he considered his next move as if a continuing battle were a certainty. Well, time for battle. Hopefully it's a quick one. I forgot about the arcane pool, but decided not to use it this round. Rolls Here. Free Actions: Call for the rest to surrender, though not diplomatically or threateningly. There was a time that Igna's response would have been Choni's own. Even after her skills had been tested as a youth both on the hunt and battlefield, it truly was not until the decimation of her family that the concept of an 'iron stomach' was fully realized. It was not that she had no revulsion or horror at the violence and the chaotic sickening behaviour carried out by the goblins, but that it was tucked away in the moment. Granted later she would want to get drunk, possibly into a fight if she was not careful and did not get most of her anger out here, but everyone has their own ways of dealing with these things. The others moved, fluid, elegant and with a wry acknowledgement to the fact that this was not the ridiculous chaos from the streets the other day, Choni knew that those she walked with at least were skilled in their own arts. It was instinct, the hum which vibrated her teeth, though she did not release it, not yet as she took in the room and at least at the moment, the smaller number of 'problems' to deal with. Never mind that it would have also been possibly better to have, for a moment, feigned being with whoever Big Ears was, that was now long and gone, and the battle awaited. Let the others speak, demand or otherwise, if Choni was to use her voice, it would be to release the power which bubbled inside, not to converse. 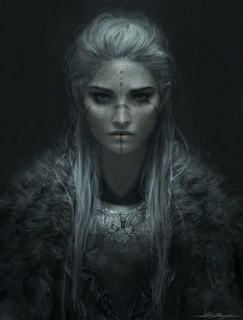 Perhaps if it came down to one last, then was a time to talk and debate with the filthy creatures, but now was for death and as she followed Edledhron, her sword slid free with a whisper of violence. It was not in complete silence she swung at the goblin, the hum still reverberated in her throat as it waited on the Skald to bring it forth. Had the ground not have been so covered in the offal and gore of the dead and dismembered, the strike may have even hit, instead a slight slip and a graze instead of her intended target. Last edited by Kapera; 01-18-2019 at 01:39 PM. They are not with Big Ear, as it happens. Quite the contrary, and it is that which gives them the element of surprise. They take initiative and charge in, weapons at the ready, a flash of movement. All are in before the Goblins can scream. "Big Ears mad! Big Ears mad! No bash brain, we no harm!" From the arrows and blades wielded, that is hardly the case. Doyle reaches them first, yelling orders at the Goblins. They bounce away, scared of him. Venka comes up behind him, armed with her horsecatcher, and prepares to do much the same. Doyle swings down, hoping to smash the Goblin before him, but it bounces away just in time. "Black hair white stripe? You mean red woman? She yell a lot, and cry, and we beat up!" Panic almost surges down Venka's spine, down all of their spines, and it empowers her. 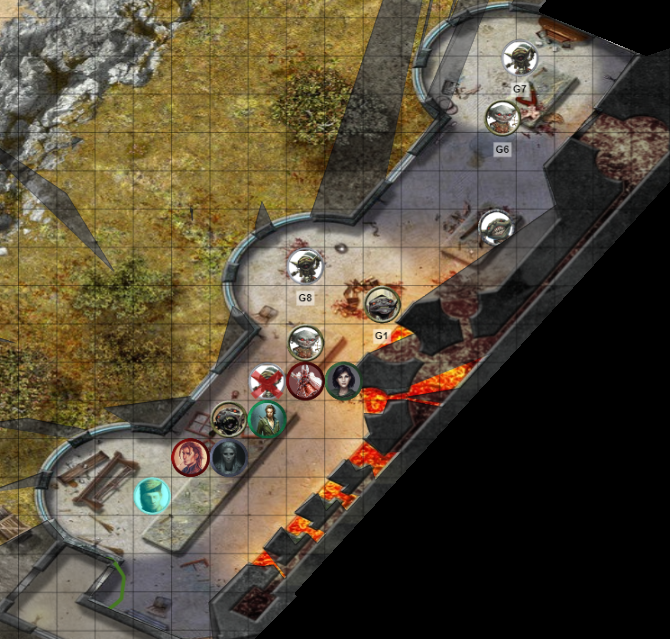 The polearm reaches forward to the Goblin before the forge, and rends into her, sending blood spilling all over the forge, sizzling on impact. She replies, "Big Ear took her, so mad!" She hisses. Nearby, Rapid draws the attention of the Goblin, faking him out as he considers who to attack and drawing all of his attention in one direction towards Igna. Hopping up on the table and over a dead body, Edledhron lunges forward as the Goblin screams, pointing at arrow at him... and never pulling back the bowstring, the blade imbedded in her shoulder blade. She gurgles, then falls off his blade, her blood joining with the dead Humans in the room. Choni comes up behind, and wielding her blade, attempts to make it as well, but only manages to make it onto the table without tripping, her own attack missing widely. And then, the Goblins remove their panic and prepare to fight. Most, in the back, notch their arrows and prepare to aim, seemingly uncaring about their compatriots in combat. The one nearest Venka prepares an arrow, perhaps unwisely but losing too much blood, and fires at her, Attack: 13missing. Beside Doyle, the Goblin he missed attempts to stab into his boot, but instead just slashes his ankles, Attack: 11not breaking the armor. Edledhron, now tall in the room, is in plain sight for the Goblin in the middle of the solarium in the center of the room, the most visible of the Goblins that had been jump-roping with the entrails. His paws still bloodied, the arrow hits Attack: 15just above his head, bouncing off and heading off into the dark whence the Saviors came. 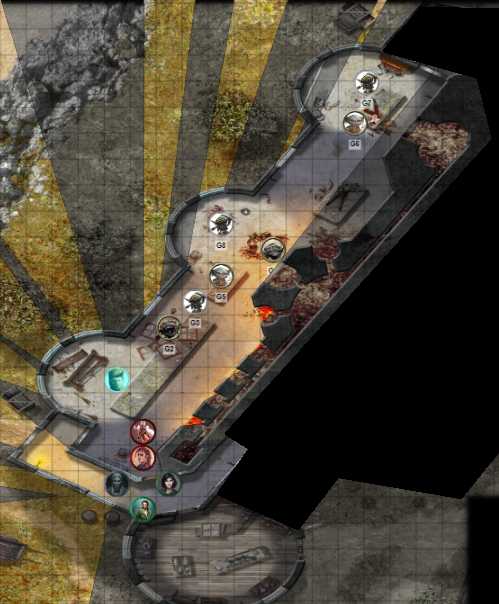 Another Goblin, almost hidden behind the forge past Venka, fires at Doyle, but misses, breaking the glass window in the solarium, causing Attack: 6the Goblin to scream. She laughs at her companion's misfortune. In the back, the two Goblins both notch arrows and aim for Doyle and Edledhron, the most obvious targets, and fire. Doyle feels the impact, but it bounces off and Attack: 10lands in the forge, catching afire almost immediately, sending smoke pouring into the near-dead Goblin's eyes. Damage: 3missing any important parts but burning. He leers, the ugly scar across his left eye highlighting the cruelty in that gleam. The Goblins have taken this place, and they won't give it up without a fight. I think I interpreted everyone's actions right, and then Blue had his own backup map. Good calls all around, and we're off to a brisk start. Good job folks. I marked the green doors I was talking about; they look like the ones we came through, but no worries. I'm sick and tired of rolling 9's, holy crap. I got more than I needed to, and only hit one of you lot. Anyway, let's dig in and knock these buggers out. Edledhron shook his head slightly as the goblins shrieked in their grating fashion, though his sharp elven ears caught something interesting. A big ear, presumably their master, took Ameiko elsewhere. His mind began to race, but even as his first oppenent fell to his blade, the others prepared their bows. While most of the arrows didn't hit their target, the elf let out a hiss of pain as one of the arrows grazed his ribs. He didn't like the pain, but there was a sense of embarrassment. First the rat-dog had bitten him and now this low goblin drew his blood. But he did his best to remember the training he had received in Erages, and focus on learning to do better later. With his mind reeled back into control, the Magus overlooked the battlefield and planned his next move within a few heartbeats and spoke in a loud voice, though even this was not a shout or cry, "If they want to die, then kill them. Quickly. A 'Big Ear' has Ameiko elsewhere." His tone of voice was a bit harder than his earlier call for surrender, mostly due to the stinging pain in his chest. He knew he would still accept a surrender, but part of his mind didn't think these goblins deserved it. After he had spoken those words, his voice resonated as he tapped into his arcane resevoir and uttered a command word in his native tongue, "Parantaa.Enhance in Elvish*" As his blade glowed briefly, he moved without hesitation. He deftly hopped off the table, a much easier feat with the aid of gravity, and his veridian eyes looked toward the goblin that barred Doyle and Venka's path. With practiced ease he Goblin 5, the one next to Venka. Attack 20 / Damage 8slashed at the pitiable little creature, opening a gash in its neck and shoulder. And as it fell, the elf gave the knight and the warrior a meaningful glance. I was going to use Color Spray, but decided to hold off... Big Ear took Ameiko, and maybe Color Spray would be better used there. Swift Action: Spend 1 arcane point to magic the weapon up for 1 minute. Move Action: 5 ft step, if allowed, 1 square north. If not, I'll roll an acrobatics, but hopping off a table is much easier than jumping up, so it makes sense to me. Standard Action: Attack Goblin G5 (one next to Venka), Att: 20 / Dam: 8 Roll here. tactics? the voice a woman behind him. For a second he was taken back to the rose yards of the Tonal Heights Temple and the gloriously beautiful Nepper Tandarah. Just the kind of phrase she would have approached him with and a warm sensation would creep into Doyle at such moments. The promise of hard training and the close proximity of the wonderful woman, all in the name of Milani, was almost uncontested event among all the things the initiate experienced at the Temple. Yet... no warm feeling crept anywhere, right now. It was Venka speaking and she seemed to have something to say, but Doyle was struggling to keep his sanity as he took in the utter act of violence the goblins have committed. Only the fact that they knew more than they had told barred him from wishing them all dead and gone. There had to be one left alive. Leave one alive though. We need a pointer to that big ear. The elf agreed as much and chopped down the one before Doyle and made room for the Milani initiate to get at one of the archers. He had, through the narrow slit of his helmet, seen the arrow pierce into Eledrhron and it was his duty to fix that. With two purposeful strides he was looming over the nearest goblin with the orange from the flames radiating in a boost of red on his plated mail and shield. From high above, came the morningstar crushing down with the weight and blessing of Milani. It tore through scalp and brain of the goblin and the holy energy was tickling back into the weapon. A jerk with the hand send the energy flowing to the elf behind him, Milani got you covered, warrior. And so, the wound from the arrow was sealed again. Now... Doyle turned his attention to the remaining goblins. Goblin brain goo was still dripping from his morningstar, who wants to survive and show us the way to this Big Ear? The rest die today for your despicable acts. To recover from the nausea was a task that was easy enough to see the reason in, but much, much harder to achieve. He sunk, felt the bile bubble up through his throat, glanced over at the goblin and see that the creature had blood running down from one corner of its wide, toothy mouth, Ugh! There was also an opportunity, though, that the young rogue could hardly pass up. His truck has worked and the goblin was glancing down on the blob of spew he had created. Over my dead body, you'll be eating that. 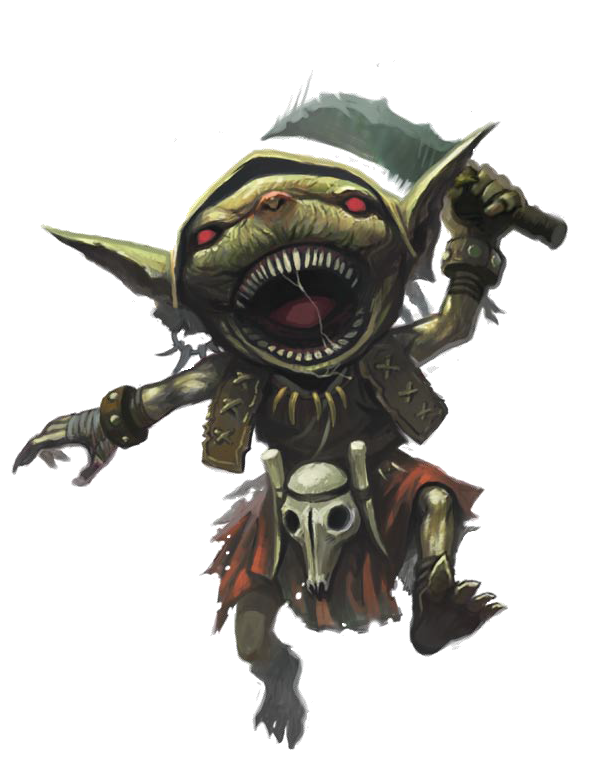 Two blades flashed in the orange light and while the first one dug deep into the back of the goblin, the pain had the goblin cringing and avoiding anything but a superficial cut from Igna's knife. Now, there was little to do, other than avoid the goblins retaliation. Igna looked up and saw how Choni stood beside him threatening the creature. He took a step up behind her, hoping to draw the goblin after him in a pursuit on the. Surely the woman would end the greenskin then. It was not a grand and amazing move, nor even a bold charge, really it was nothing like what her brothers would have done, what her father even now as he sought out to end the scourge which roamed. It was but a simple move as the creature stood just below her, one at a time and now the buzz had truly grown in her throat, yet not when at her very feet a thing existed which needed to die. A slash, this time without step nor movement and thus risk of falling on the gore and offal, and while not horrifically deep, it still made contact with the creature as the metal bit into flesh. Her eyes were cold, harsh and emotionless as Choni turned her head ever so slightly toward Igna and gave the youth a nod, a movement of camaraderie and acceptance before she turned back to look toward the soon to be arches with a low oath of annoyance. "Incoming shots, make quick work that we do not fall further behind." Words spoken, though there was a soft burr in her voice, the hum at the base of it as she sought out the space beyond them and smiled at the various implements at hand. A warning given, she hopped down from the table and began to close the distance between she and the other goblins, the forge now close to her right with a wicked grin now as it curled upon her lips. Venka felt a chill go down her spine when the goblin explained, rather panicked, what had happened to Ameiko. The calm that Choni had helped her achieve threatened to shatter, and she swung her polearm at the wounded goblin in front of her. Her Attack: 14 for 3 damage.aim was off and the blade sent sparks flying as it hit the floor, but she didn't really care at that moment. Doyle was right, they needed to leave one alive, and it could be this one. She left the weapon low, blade turned up, and AoO: 18 for 2 damageready to bisect the creature if it didn't speak. "Where did big ears take her, and when? Answer and you'll be the one who lives," she threatened. The goblins further back with bows drawn were a concern, but no matter what the one in front of her said, she'd be moving to intercept them in just a few seconds. Last edited by LittleBlueNA; 02-08-2019 at 12:43 PM.